My son Luke graduated from East Clinton High School in 2014, shortly after he was hired for the Clinton County Highway Department. On a normal routine day while at work, he fell out of the back of the truck and sustained a severe head injury. In need of immediate medical attention, Luke was fl own from the scene to Miami Valley Hospital. A few days later on June 13th, he was declared brain dead. It was three weeks after his graduation. Luke was an organ donor and as his parents, we honored his wishes. With Luke’s gift of organ, eye, and tissue, his choice has directly impacted the lives of over 75 other people. His death has taken a horrible toll on us, but we have been turning our grief into something positive as we focus on his life and his legacy. In the wake of this tragedy, we started the Live for Luke Scholarship Fund in his memory. My husband and I have become active Donate Life Ambassadors advocating to help spread the word about the importance of registering as a donor. Luke’s story has become something very special. We’ve been fortunate enough to share it with newspapers, local TV news outlets with the help of organizations like Life Connection of Ohio and LifeCenter. 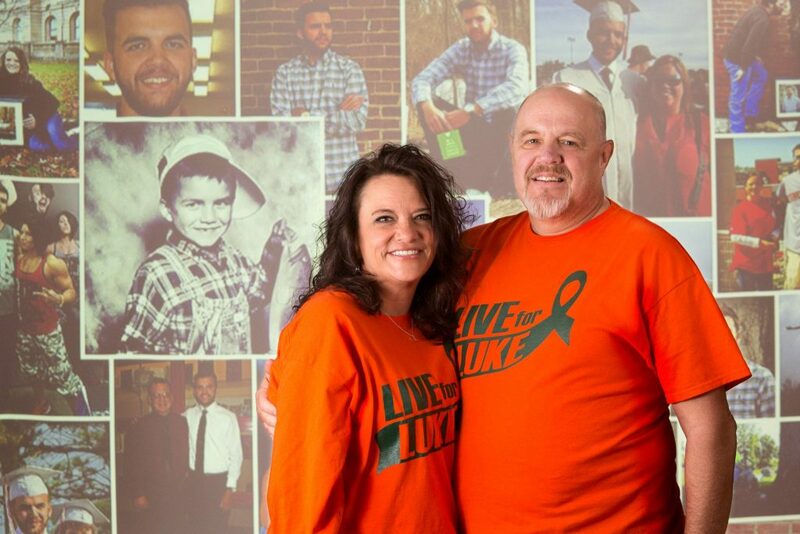 The biggest blessing of all has been our ability to connect with three of the seven of Luke’s organ recipients. We’ve been contacted by the liver recipient as well as one of Luke’s kidney recipients, a woman named Debbie from Texas. We have also met his heart recipient, Bill, face to face, heart to heart. Hearing Luke’s heart beat again was bittersweet. Because the life of a wonderful young man had ended, Bill’s life could continue. Being able to hear my son’s heart beat again is something I cannot even explain in words. Our heart family and Bill are a huge part of our lives to this day, and will forever be. Luke is a hero to so many people. But to his Momma …. he’s more than a hero, he’s my heart, my first love, my joy, my soul, my everything. He’s our Son.